From “Mathematics Education: A Humanist Viewpoint”, Braunfeld, Peter, Burt A. Kaufman, and Vincent Haag, Education Technology, November 1973. If you read the guest blog post by IMACS alumnus, Steve Krouse, the following sentence may have resonated with you, either as a memory from childhood or as a more recent parenting experience: “The summer after 8th grade I took Algebra II to catch up in math (a subject I despised only a few years prior because of my failure to perform in arithmetic timed tests).” Thankfully, Steve found his way and is doing well in college today. 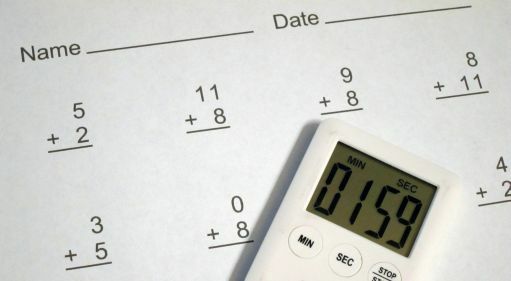 But why do some mathematically talented children, who perform exceptionally well in untimed situations, have difficulty with timed arithmetic tests? More importantly, how can we help these kids? A good first step may be to let these children know that their intelligence is not in doubt because such tests are hardly good indicators of mathematical ability. Rather their primary aim is to measure how many facts a student can recall correctly within a finite period. After all, a student who can memorize and regurgitate math facts is not necessarily able to understand the reasoning behind those facts. Further exacerbating the issue of speed is the fact that in answering an individual problem a student begins by reading the problem and ends by writing the answer. Just looking at the structure of the tests themselves points to three possible reasons why some bright children perform poorly on them. One might be the repetitive nature of timed tests—you have to do many of the same kind of problems, over and over. When gifted children are asked to do a repetitive task their minds often wander to more interesting thoughts. (And for a child, there are so many fascinating ones from which to choose!) Any resulting score or grade will seem low and out of sync with the child’s natural abilities. When this happens, why don’t people think “That’s a natural outcome” instead of “That child needs to focus”? Surely you have been obligated to attend a function (e.g., industry conference, religious service, etc.) that was of little or no interest to you. It’s very likely that your mind, gifted or not, “strayed” to more engaging thoughts. Was this a definite sign that you are unable to focus? No. And the same is true for a bright child whose mind wanders away from a bunch of monotonous arithmetic problems. Another explanation may be the speed at which the child reads, comprehends, and solves each question. Contrary to popular misconception gifted children can, in fact, be slow processors. Others may be perfectionists who go over each problem multiple times to avoid getting wrong answers. Some may be visual-spatial learners who would do better with shapes instead of numerals. Besides, we all know high-functioning adults who are slower at some things and faster at others. How does the slow-processing child grow into the successful adult? Chances are, someone along the way helped that child redefine slowness as carefulness and focus on a career field where carefulness is highly valued. Finally, a timed test taker must write the answer to each and every problem on the page. This requires significant fine motor skills. For younger children, fine motor skills are often still developing. For gifted children of any age, their thoughts sometimes outpace their fingers thereby causing frustration that can interfere with clear thinking. Again, some may be perfectionists who want the numbers to look just so. Why can’t these students be allowed to give answers orally or type them on a keyboard? Sometimes, you wouldn’t know that we live in the 21st century with the way tests like these are still administered in some schools. There are certainly other reasons why a mathematically talented child may not perform well on timed arithmetic tests. Organizations like the Davidson Institute for Talent Development provide a wealth of information such as this article on the topic. Whatever the reasons, these kids should be helped by the adults around them to understand that low performance on such tests are neither a measure of math ability nor a predictor of future success. We owe it to them to keep unhelpful and sometimes debilitating barriers out of their way on the path to excellence and high achievement. Explore your mathematical talent at IMACS! Check out our online courses in gifted math and computer science. Visit www.elementsofmathematics.com to learn about our Elements of Mathematics: Foundations online courses for middle school students. Get weekly IMACS logic puzzles on Facebook.